In the wake of ELP’s triumphant 40th Anniversary reunion High Voltage Festival headline concert in London on July 25th 2010, Universal / Sanctuary Records are set to release a commemorative double CD compilation, ‘High Voltage’ on August 16th. This 2CD collection brings together all those works and pieces that made ELP the legends they are today. Compiled by the band, High Voltage is all at once both an introduction and celebration of the ELP canon but to use that old football phrase, it’s also a game of two halves. Disc one provides the band at their most overly experimental and progressive as they blend their virtuoso and classically trained chops to celebrated works by Mussorgsky (Pictures At An Exhibition) and their very own seven movement piece titled, ‘Tarkus’ taken from their groundbreaking second album of the same name first released in 1971. Disc two offers slightly more digestible fare with a clutch of tracks ranging from Greg Lake’s ‘Lucky Man’ and ‘Take A Pebble’ along with the Bartok modified ‘Barbarian’ all taken from the band’s first album, to ‘Touch And Go’ with Cozy Powell as replacement drummer for Carl Palmer for the suitably titled ELPowell variation in 1986. And of course, no ELP collection could ever be complete without their signature Aaron Copland re-working of ‘Fanfare For The Common Man’ first released on the Works Volume 1 album in 1977. Between 1970 and 1978, Emerson Lake & Palmer became one of the most exciting rock bands on the planet. From their stunning introduction during the Isle Of Wight Festival in 1970, the trio became a by-word for virtuoso musicianship and the over-the-top extravagances associated with Rock ‘N’ Roll during the 70s. Never afraid to tear-up and re-write the rule book on how popular music could be consumed and presented, Keith Emerson (keyboards), Greg Lake (bass & vocals) and Carl Palmer (drums & percussion) took many risks as both studio recording artists and on-stage performers. Their marrying of neo-classical works to Heavy Rock with dazzling special effects under arena conditions was a presentation which had to be experienced at first-hand to be truly believed! Releasing a succession of multi-award winning albums, ELP finally called a halt to their initial career in 1978 though later reformed for two years and as many more albums. ‘High Voltage’, which is based on the set list of songs performed at ELP’s 40th anniversary headline show at the High Voltage Festival – their first live appearance for twelve years – is a fantastic introduction to, and celebration of, Progressive Rock’s first Supergroup. EMERSON LAKE AND PALMER were Progressive Rock's first Supergroup. Their flamboyance on record and in the studio echoed the best work of the heavy metal acts of the era but took it one GIGANTIC stage further. ELP incorporated elements of Classical music - the very genre which had originally inspired many contemporary hard rock groups - into their sound, all effortlessly achieved with an awesome level of sheer technical excellence. ELP, who at a conservative estimate have sold more than 40 million albums since their inception, were the first Progressive Rock Group to pack out stadiums all over the world. ELP's live performance at the Isle Of Wight Festival in August 1970, before hundreds of thousands of fans, catapulted the band into rock's stratosphere even before they had recorded their first album. Their spectacular stage sets, including a revolving drum kit, Quadrophonic sound, a grand piano that rose 30 feet into the air and flipped end over end, and a spectacular lighting system, rapidly became the stuff of legend. Concerts would end with huge, extravagant pyrotechnics, the keyboards screaming feedback through massive PA systems, Emerson having speared the keyboards with 18 inch daggers to keep the keys down. Now for the first time, a double best of - 'The Ultimate Collection' - CD, featuring the best known tracks from the best known albums of this unparalleled, groundbreaking, spectacular rock act has been compiled. 'The Ultimate Collection' is a fantastic compilation, not only for long term fans, but also young rock aficionados keen to explore the music of one of Britain's biggest rock heritage bands - ever. Roland Hyams on 020 8677 8466 or 020 8769 6713. April 30 Masterclass for the students and Drum Circle for the deaf children at St. Bedes Grammar School in Bradford. "To the uninitiated, the very fact that Emerson, Lake & Palmer attained such heady heights, receiving plaudits world wide for their inspired brand of progressive rock music and becoming one of the major players in the rock scene in a mere eight years (as indeed they did in their initial incarnation), might be a little too much to take in. But to those in the know, someone such as your good self who has had the astuteness to pick up this collection of the band's finest and most popular works, it will come as no surprise. By the time Greg Lake finally persuaded a 20-year old Carl Palmer to join this new rock tour de force alongside himself and Keith Emerson, the youthful trio had already been involved with such heady luminaries as The Nice, The Gods (a band featuring Lake alongside future Stones guitarist Mick Taylor and Uriah Heep's Ken Hensley), King Crimson, Chris Farlowe & The Thunderbirds, The Crazy World Of Arthur Brown and Atomic Rooster. It's hardly a surprise such prodigious talent produced a band as enigmatic and successful as ELP! The seeds of ELP were sown when The Nice and King Crimson ended up performing together in San Francisco. Emerson, who had learnt his trade playing jazz, rock or big band music whilst working in a bank and who had already made a name for himself as an extravagant performer in The Nice, felt he could take The Nice's blend of classical themes fused with '60s rock further. Lake was suitably inspired and left King Crimson after their second album 'In The Wake Of Poseidon'. With the youthful Palmer on board, the trio set about their new project with enthusiasm. Initial rehearsals at Island Studios saw the fledgling band tackling The Nice's 'Rondo' as well as King Crimson's '21st Century Schizoid Man'. With Lake having switched from playing guitar to bass during his Crimson days, the band's sound allowed for bass, keyboard and drums to combine to emphatic effect, the lack of a lead guitar lending them a distinct sound. And the evident talent that lay in all three protagonists meant that they were never afraid to strike out on their own chosen path. Fear was something that rarely troubled ELP. Their ever second gig saw them appearing at the Isle Of Wight Festival in August 1970 before their debut album had even been unleashed. Undaunted by the presence further up the bill of well established acts like The Who, The Doors and Jimi Hendrix, they set about their task with panache, climaxing their set with the gunfire of two brass canons. ELP swiftly followed their headline grabbing set with the release of 'Emerson, Lake & Palmer', their debut album on Island Records. It was an immediate success, reaching No. 4 in the UK charts and even breaking into the US Top 20. From the off they dived headfirst into the kind of lengthy epics that would become the band's trademark, 'Knife Edge' being a fine example. And yet there was also a subtle side to the band, often overlooked. Lake's beautiful ballad 'Lucky Man' or the poignant 'Take A Pebble', both of which are shining examples of simple song structure with the added dash of virtuoso performance. Within a year not one but two new ELP albums had hit the streets, proving this was no band to do things by halves. 'Tarkus' was released in June 1971, and plunged unashamedly into the 20-minute plus title. Made up of seven different movements of the title track and based around the mythological half-tank, half-armadillo creature that graced the cover the album clearly appealed to the burgeoning movement of progressive rock fans, who duly sent the album to the top of the charts. Mussorgsky's 'Pictures At An Exhibition', was (and remains) a staple part of the ELP live show. This version, recorded at Newcastle's City Hall in March 1971 and released that November, showed that ELP's lack of fear in tackling complex classical pieces in a rock format continued to set them apart from peers like Yes, Genesis and Pink Floyd who tended to stick with self-penned material. The climactic 'Great Gates Of Kiev' shows all three musicians, allowed off the leash throughout the work, combining to full effect, whilst the ebullient encore of Kim Fowley's 'Nutrocker' was released as a single. Less than eight months later, in July 1972, 'Trilogy' showed the trio's relentless pursuit of perfection and glory was gaining apace. With Emerson increasingly adopting new technology to add to his ever-expanding bank of keyboards, the band also undertook a massive world tour, and new songs such as their version of Aaron Copeland's 'Hoedown' and the jazzy swing of 'From The Beginning' (their highest charting US single) were wowing the crowds. The ensuing tour was captured for prosperity on the triple live album 'Welcome Back My friends To The Show That Never Ends - Ladies And Gentlemen, Emerson, Lake & Palmer', the whole package echoing the kind of overblown concepts that were creeping into the prog genre and would later undermine it. Shattered from five years relentless touring and recording, ELP took a break to recharge battery banks and re-fill wells of inspiration. When they did re-appear it was in 1977 with the double set 'Works Vol. 1'. It showed that whilst away, the individual members had been busy on solo works that took up a side each. Lake's 'C'est La Vie' features here, whilst Emerson remains rightly proud of his own 'Piano Concerto No. 1' as is Palmer of his version of Prokofiev's 'The Enemy God Dances With The Black Spirits', and the collaborative 'Pirates' (originally meant for the score to Frederick Forsyth's Dogs Of War) is a real stunner. Alas the solo emphasis of 'Works Vol. 1' however, following on from the band's protracted break in schedule hinted that perhaps all was not well within the band. A second volume, 'Works Vol. II' was also released, but this was not 1971 ñ the last time ELP had issued two albums in one year. Punk was raging all around them as ELP tried to steady the ship. 'Works Vol. II' may have tried to put the emphasis back on the group, but it was still Greg Lake's 'I Believe In Father Christmas' that yielded a surprise seasonal hit, whilst 'Tiger In A Spotlight' and 'Brain Salad Surgery, both featured here, dated back to the 'Brain Salad Surgery' sessions. In an effort to steady the ship, ELP resorted to what they knew best, and fearlessly threw themselves into another massive world tour, this time with an orchestra of 60 plus musicians. Things did not auger well however, and after two concerts at Montreal's Olympic Stadium the spiralling costs forced the band to disband the orchestra and continue simply as a three piece. It was not an enjoyable experience for a band who prided themselves on innovation and exploration. Matters were made worse when Atlantic Records, distributors of Manticore, forced the tired and weary band into a Nassau studio to record a new album to fulfil contractual obligations. The resultant album was 1978's 'Love Beach'. Despite the critical panning it took at the time the single 'All I Want Is You' and the band's stirring version of Rodrigo's 'Canaria' prove there was still some life left in the band. 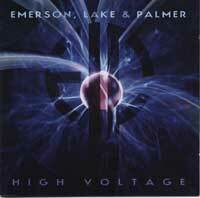 Yet by the time a lone Keith Emerson put the finishing touches to the record, both Lake and Palmer had flown home. ELP were over. A live offering of from the ill-fated Montreal shows, 'In Concert', was released in 1979 boasting a sprightly cover of 'Peter Gunn', and a hastily packaged 'Best Of' was released a year after that. Greg Lake began a solo career, hooking up with ex-Thin Lizzy guitarist Gary Moore for 1981's 'Greg Lake'. 'Manoeuvres' followed in 1983. Palmer formed his own band PM who released one album, '1PM', in 1980, before forming the hugely successful Asia with John Wetton, Geoff Downes and Steve Howe. And Emerson busied himself with a myriad of film scores. Emerson and Lake hooked up with Cozy Powell to form Emerson, Lake & Powell in 1986 and Emerson and Palmer joined forces with American Robert Berry for 1989's 3 project, issuing 'To The Power Of Three'. But until 1991, that was the closest anyone got to a full-blown ELP reunion. And then the news was announced Emerson, Lake & Palmer had reunited to record a new album. 1992's 'Black Moon' showed a band that had matured and adapted with the times, yet still displayed virtuoso performances. The ominous title track is a booming rocker whilst single 'Affairs Of The Heart' displayed a more contemporary edge to the ELP sound. The band celebrated with three sold out shows at the legendary Royal Albert Hall from which came 1993's 'Live At The Royal Albert Hall'. The same year the trio re-recorded some old material for the 'Return Of The Manticore' box set and began work on a new studio album. Sadly an injury to Emerson dulled the effect of 1994's 'In The Hot Seat' and prevented the band from touring for two years. 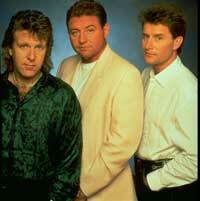 And then, in 1998, Greg Lake once more left ELP. There's been no new ELP album since. Neither has there been any new Greg Lake album. But Emerson penned his autobiography, 'Pictures Of An Exhibitionist' and reformed The Nice, who recently toured the UK. And Palmer, in between the odd appearance on the BBC TV show The Generation Game (hosted by ELP fan Jim Davidson) hooked up with old Asia partner John Wetton in Qango. So will we see ELP again? Keith Emerson recently told Classic Rock magazine "I haven't heard from Greg Lake. And I don't expect to". But rumours persist, and you hold no finer representation of the ELP magic in your hands. Next year will be the band's 35th Anniversary. Who'd bet against it?" Jerry Ewing, Classic Rock Magazine, February 2004.